- The knife set comes with four different knives. - A scissors is included as well in the set. Our kitchen appliances are a fine example of innovation, style, quality and durability. With the continuous and sincere efforts of our deft professionals, we are manufacturing a high quality range of Stainless Steel Knife. We are a unique name in the industry, devoted towards offering the best quality range of Horn Knives Set. We are offering our client an excellent quality range of Kitchen knife. These knife are made from very high quality stainless steel raw material which ensures high durability at its user end. 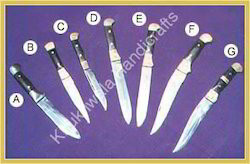 These Kitchen knife are available in various designer patterns and designs. Our range of Kitchen knife are available at most competitive prices. We are among the reputed organizations, deeply engaged in offering an optimum quality range of Kitchen Knife. - This handmade cake server and knife set from Sage Koncpt is made of stainless steel. The Sage Koncpt set has a classy design, silver finish and a comfortable handle which is easy to grip. ATTRACTIVE COLORFULL KNIFE SET, ESPECIALLY DESIGNED FOR UR MODERN KNITCHENS.